Have you ever wondered how some traditions began and how they stick around and you don't really think about why, you just.... carry on? 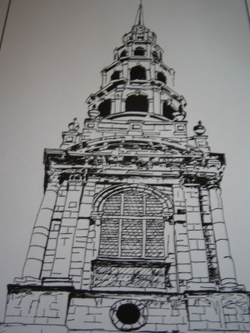 This is my pen and ink drawing of the steeple of St. Bridget Church on Fleet Street in London, better known as St. Bride's. It is reaching to the heavens as a symbol of the perfect love, the love that looks heavenward. This layered steeple, an unusual feature made of five octagonal stages of diminishing height telescoped together, is the only noteworthy exterior ornament of the church and is the highest steeple legendary architect Christopher Wren ever built. The steeple, as legend has it, inspired a pastry chef to make a wedding cake in layers for his bride. And now you know why we still have our layered cakes at weddings today. Now that was interesting! Of course, I've always been into off-the-wall trivia. Your posts always leave me in awe. First of all -- the drawing -- yours? Very nice to have such talent. And now, I thought it was about bread, building a solid foundation for life -- I did not know this. Wow! You are a woman of many talents!! Great drawing!! !